Gallery 400 regularly exhibits new work by Illinois artists. In group exhibitions Gallery 400 often premieres new works by local and national artists together. Recent examples include I am Eyebeam (2007) and This Shadow is a Bit of Ideology (2008). Significant exhibitions from Gallery 400’s history include fag-o-sites (1995) including 30 artists exploring queer issues; and Hello Mr. Soul (2000), which evocatively explored men and aging. The Gallery regularly presents one-person shows of works not easily seen in the Chicago area. For example, 2003’s Rubén Ortiz-Torres: New Works premiered the sculptures, prints, and customized machines that explore the class and labor implications in US and Mexican cultural confrontation. 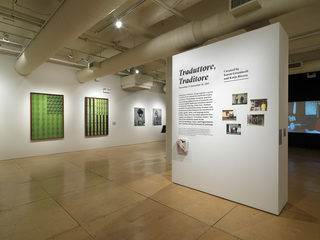 Gallery 400’s Voices lecture series is a premier forum in Chicago for discourse in the field of art and design practice. Significant artists, critics, designers and art historians discuss timely ideas and workingmethods. Voices extends the educational programs of the Gallery and UIC to provide the public at large direct contact with a diverse range of artistic practices and positions. Recent speakers include: Carlos Amorales (Mexico), Meg Cranston (CA), Maud Lavin (IL), Anne Wilson (IL), Olafur Eliasson (Iceland), Arturo Herrera (Germany), Jan Jagodzinski (Canada), Christine Kim (NY), Glenn Ligon (NY), Kori Newkirk (CA), Pepon Osorio (NY), Michael Rakowitz (IL), Steve Roden (CA), and Mark Wallinger (UK). Throughout its history Gallery 400 has commissioned ground-breaking large-scale new works through residencies, comprising varied combinations of workshops for students, public lectures, the creation of large-scale new works, and collaborations between the artist, students, and partner community groups. Significant examples include Rirkrit Tiravanija’s 1996 In and Out; Byron Kim’s 1998 Deposit; and Siemon Allen’s House (2000). The most ambitious residency/commission to date was Edgar Arceneaux’s The Alchemy of Comedy…Stupid of 2006. As a showcase for engaging art and architecture exhibitions, Gallery 400 is an essential complement to the academic programs of UIC’s College of Architecture and the Arts. Students from the College and from other University disciplines have the opportunity to interact closely with art and artists, engage diverse exhibition possibilities, and participate in current discourse surrounding contemporary art, architecture and design.